I used all FunStampersJourney product. Card blank: 9 3/4″ by 6 3/8″ folded in half and creased with crease tool. 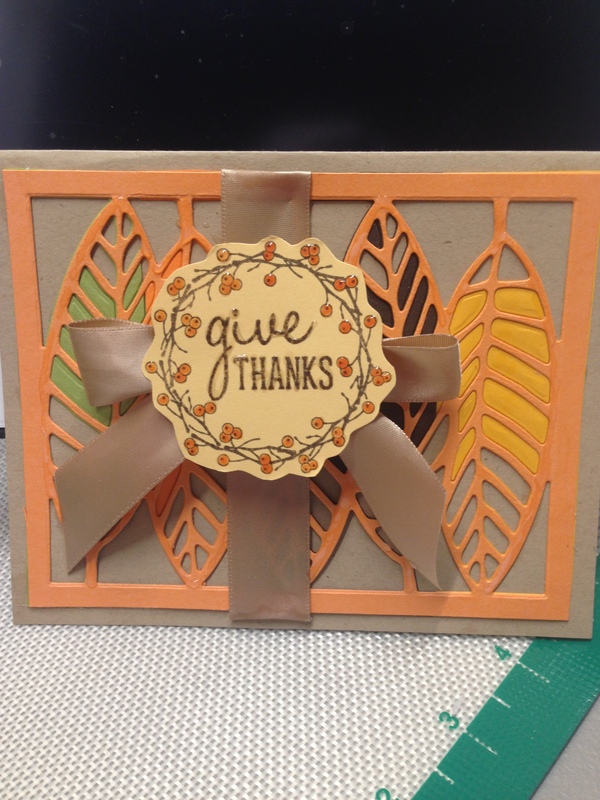 layer 1: take 2 1/2″ strips of Citrus Cooler, Pineapple Smoothie, Lemon Grass and Hazelnut blend Card Stock,place size by side and tape together, run through your die cutting machine ( I use my Amaze Machine ) with the Layered Leaves die DI-0215 and then remove some of the pieces in the middle but not all, then run another piece of Orange Creamcicle with same Layered leaves die, this time remove all interior pieces and adhear all together with Journey Craft Glue. Then using the picture place a piece of Oatmeal Satin Ribbon over all the die cut pieces and glue all layers to the Oatmeal Cookie card base. Make a bow with another piece of Oatmeal Satin Ribbon and adhear to card with medium Foam Squares. Stamp on a scrap piece of Pineapple Smoothie Cardstock AT-0159 Grateful Heart with Hazelnut Blend ink. Color on the stamped image with Pineapple Smoothie Reinker or coloring device of your choice. Fussy cut the whole image and Place over bow with Foam square and use Journey glaze to decorate the outside leaves and the berries and saying. Enjoy!